It is no secret that I am not a 5k runner. I usually forsake these events for longer ones, primarily half marathons and challenge races. This is largely because I am not a fan of speed work, instead I just prefer to get out and go, without regard for pace. In a 5k, it is hard for me not to focus on tempo and speed. 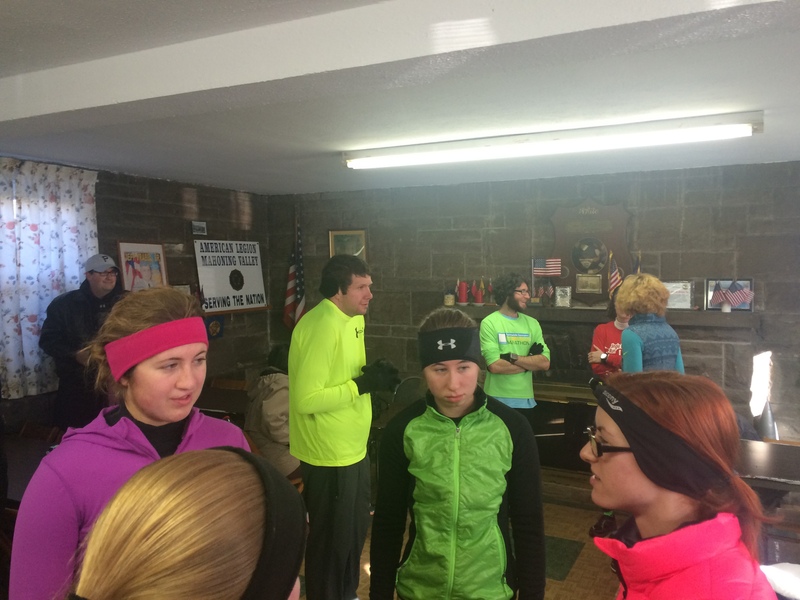 Runners warming up (literally) in the American Legion Hall before the race. A friend of mine, J.P. Moran, reached out to me an invited me to run a local race that has become somewhat of a tradition in our hometown. You see, many years ago a bunch of friends who ran track for the Poland (Ohio) Local Schools started to informally run a 5k together on every New Year’s Eve. This tradition grew into the quintessential hometown 5k: no entry fees, no bibs, no electronic timers, no SMO’s…just alumni and members of the community gathering together for a fun run to celebrate the ending of one year and the beginning of the next, with a healthy dose of friendship and comradery for good measure. Despite the very cold forecast, how could I say no to either a friend or to such an event? No hotels. No overnight stays. No hour-plus-long drives. Heck, I could walk to this race! In fact, I needed 4 miles to hit my mileage goal for 2014, so I figured that if I ran to the starting line along a particular route, it would take me just over a mile. Add that to the 3.1 mile race course and I would just make it for my annual mileage goal. I love it when a plan works! There is no expo. The meeting point is the basement of the local American Legion Hall, which, on this day was very welcome because it had heat! Did I mention that it was cold? We are talking low-teens, and since I had just run a little over a mile to get there, I was grateful to be able to warm up a bit before going out to the starting line. There was no swag, though participants gladly shared the boxes of donuts they brought for their fellow runners (I told you this is the quintessential local community event!). The hardest part about running in the cold weather is getting your clothing just right. Too little and you will freeze; too much and you will sweat uncomfortably. I wore my Brooks base layer that I received for running the Marine Corps Marathon, a C9 long sleeved cold weather gear shirt, a pair of C9 compression shorts and long pants, plus a pair of Starter running pants, plus a reflective vest as a shell layer for the wind, plus a SweatVac cold weather beanie, plus a pair of The North Face gloves. That is a lot of plusses…like I said, it was cold! Runners getting ready for the start. I also wore my Saucony Verrata running shoes I was using to train for the Dopey Challenge. I grabbed my Iphone 5S and the IPhone earbuds (as they would be secured in my ears by my Sweatvac beanie, I did not need to wear my usual Yurbud Triathlon earbuds which are usually more secure in my ears). My hometown of Poland, Ohio is a beautiful historic area, and even moreso when it is snow covered. There are numerous homes along the tree-lined streets that are more than 100 years old, and the course would take us by the historic school building where President William McKinley once taught. 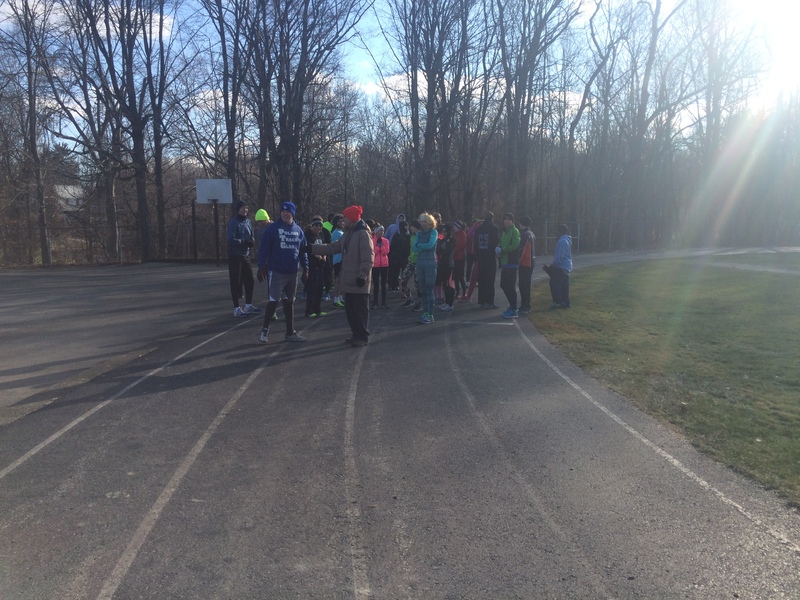 We began at the track of the Middle School Stadium, which was built as a WPA project. After a lap around the paved track we exited out onto the tree-lined streets and went off into the historic Poland neighborhoods. As the course was laid out by volunteers, there were not many course markers, which is fine. However, even with the pre-race brief where organizers explained the course, I felt compelled to push myself to not lose contact with the pack so I could ensure that I stayed on the course. The problem with this was that the field was MUCH faster than I am, so I really did need to push myself harder than I normally would while running a 5k…not that this is the worst thing in the world, despite my usual protests, a little speed work is not a bad thing. After a loop through a residential neighborhood we were again facing the historic Poland Middle School, and turned right to head into the Poland Municipal Forrest, which is a beautiful nature preserve gifted to the people of the town by a former resident. I run these woods all the time during training, but this would be the first time that I ran them during a race. Unexpected Magic. 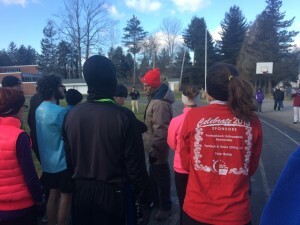 The best part was that this stretch to the woods was an out-and-back portion, which afforded the runners the opportunity to see and offer encouraging words of support to one another – to me this really exemplified the friendly spirit that runners have, and that should be shared more often. Once in the Poland Woods we negotiated our way down a slight incline (it was a little icy, so we had to watch our footing), but the cold temperatures meant that the mixed gravel and dirt road was firm that morning. We did a loop along one of the trails before making our way back towards the entrance. At this point, I had completely lost contact with the main grouping, and was left running with just a handful of other runners at the back of the field. Now, I make no secret of the fact that I am not the fastest runner, but this was the first time I ever found myself near very last place in a race. I ascribe to the belief that neither your pace nor where you finish dictate whether you are or are not “a runner,” your passion, and motivation, and determination do. Being at the end of this race, pushing myself to hit a PR time in this race, in a field with so many runners far faster than myself – reminded me of this. I was running my race for my reasons, and that is all that mattered. Runners gathered to cheer their fellow runners on. Exiting the woods, we made our way in the last mile, which again took us by the Middle School, but this time I saw a fellow runner make a wrong turn down a street ahead of us. Another runner and I called out to him to let him know. He was appreciative for the help, but it is really something any runner should and would do for another runner. Back on the course, this other runner and I were playing a friendly game of cat and mouse during the last mile as I kept trying to pass her, but when I would get close, she ramp it up and not let me reach her. Finally, just before we re-entered the stadium for the final half lap around the track, I managed to catch and pass her, and then had to hold on. She gave me everything she had and pushed me harder than I have ever been pushed in a race, but I managed to narrowly edge her out at the end. Afterwards we both smiled, high-fived each other, and thanked one another for pushing so hard, which made for an enjoyable race experience. There was no SMO for this one, but that is not the point of the race. There were some donated prizes for participants, who were able to select from the assortment in their order of finish. This made for a nice little twist on this event even though one does not run this race for the prizes. While I was excited to be able to walk/jog to the start of the race, it never occurred to me that this meant that I would have to walk/jog home. While this normally would not be that big of a deal, it was COLD, as in really freakin’ COLD (even much much colder than when I ran Pluto’s 5k the following month), and I was sweaty, which made me that much colder. But I made it home in plenty of time to shower and pop the bubbly for the New Year’s Eve festivities. I don’t want to talk about my IPhone playlist, but instead I want to talk about my IPhone. It was very cold the morning of the race. How cold was it? Well…did you know that it is possible for it to get so cold that your IPhone literally stops working? Yeah, I didn’t. However, during the second mile of the race in the Woods, I had my IPhone in the pocket of my running vest and all of a sudden the music stopped. I pulled it out and saw a warning on the screen that the phone was shutting down due to the cold. I never knew this could happen, though I suppose it makes sense. It also should have been a warning that it was way too cold to be running on this day! But you know me, I do not run without music. Accept. Adjust. Advance. I powered my IPhone back up and took off one of my running gloves and wrapped the IPhone in it to keep it warmer as I continued with the race. I tucked my hand into the sleeves of my running shirt to keep it warm. This was an enjoyable race and I can see why the participants look forward to running it every New Year’s Eve. In fact, many drove in from several hours away just to run it. I was glad that J.P. invited me to participate and that I had the chance to experience it for myself. Will I run it again? If I am able to next New Year’s Eve, I can certainly see myself doing so, and I hope to see many more Poland alumni and members of community there as well. Oh, and for good measure I checked my app at the end of the race: I had indeed surpassed my mileage goal for 2014, and logged a fun 5k race in the process. So the Crazy Lenny 5k turned out to be a great way to end my Casual Running year.